Racks getting full? Go vertical. Racks getting full? Can’t squeeze another thing on them? That’s right: hang a curated selection of garments vertically. Try the end of a rack, the first item on each arm of a 2- or 4-way, heck, even a nail in the wall works! To avoid a mish-mash look, choose similar colors and styles of whatever you’re displaying whether it’s scarves, shirts, or pants. 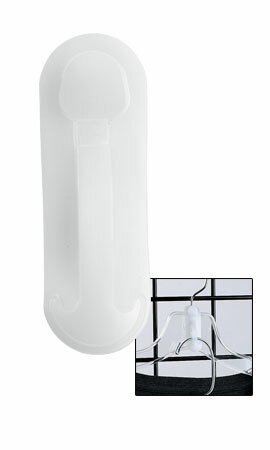 The piggyback connector holds 2 garments, and the hanger strip holds up to ten. With the piggyback connector, you could coordinate a complete 2-way with multiple suggested outfits. Maybe your best sweaters with chinos in a like size? A transitional dress with a cardigan or shrug to take it into cooler weather? The piggyback is a Godsend to home decor shops trying to keep the napkins with the tablecloth! 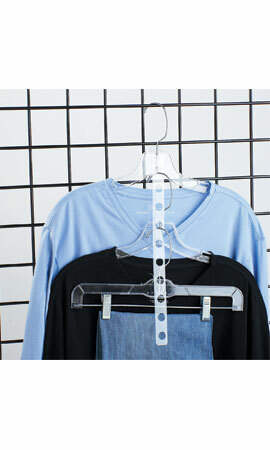 The hanger strip, with larger capacity, is best for light-weight goods. Camisoles or leggings? Onesies? Or use the strip to keep the complete set of 8 placemats together. Need more ways to make every inch of your shop productive? Use the best strategies in The Essential Guide to Using ALL Your Space. Get it here. After all, You PAY for every inch: Use it ALL! Product photos courtesy of Store Supply Warehouse.